I started a blog dedicated to self care called School Counselor on the Run! Don't worry, School Counselor Blog isn't going anywhere! 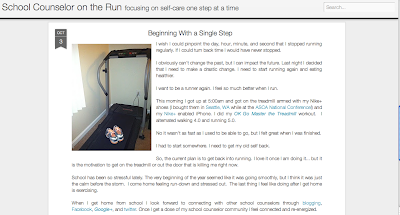 I started School Counselor on the Run, a blog about focusing on self care one step at a time! On School Counselor on the Run I plan to write about running, food, school counseling... and life in general. Check out the links below to follow me on this new journey!